1: Most germanium PNP circuits are positive ground. Why can this circuit be negative ground? 2: What model are those inline trimmers? They seem much more elegant than the offset trimmers. Because if you look the pins have been reverse to what you would expect in an effect with the emitter rather than colletor to supply. You can make a negative ground Fuzz Face with PNP transistors by doing exactly the same thing and just swapping the collector and emitter connections. I've recently bought some of those trimmers (not in 5K unfortunately so I'll have to get some), have a look on eBay for "3296 trimmer"
I'll try to get this done by Monday... but I've heard it doesn't work well with GT313s.... this might be a problem. Works. Although there's a slight error in the math. ("We stick the device into the socket, and read the voltage before we press the switch. It reads (100E-6)*(2472) = 247mV." -geofex) So it's multiplication and not division. Otherwise perfect! Just went through my entire batch of MP38As. Not a bad deal to get 50 of those for 15€.. Most of them are crap, something like 30 of them - measuring 45-70 hFE. 15 are at 70-80 and last five are all over 90 hFE. Only two or three were near 200µA on leakage, and nearly all measured 50-90µA. Took me a couple hours, but now i can really start to think what i'll do with them! Muahahahahaha!!! I'll clean up my spreadsheet calculator and post it. Soonish. Tomorrow. I promise. RG wrote that in a strange way IMO. The meter doesn't read the calculation, it reads the result so to get the gain from the reading you'd do it in reverse and divide. But the calcs I've shown don't take into consideration the false gain reading due to the leakage, I only showed how to calculate the real gain and leakage in mA. You're right. That only affects the leakage calculations, so it's nothing to worry about. I got confused at the start anyway, but finally got it right. Russian germaniums are great. I've bought maybe 15 different types and the only dodgy ones from that lot were GT404B's, many of which are very leaky. All the rest have been excellent. Lol I know this thread is old but I recently ordered some MP38s and had some better luck. They were supposed to be rated 35-75 hfe, but nearly all of them (out of a batch of 40) were in the 90-100 range with about 3 sitting in the 70-80 range. Only two of them read below 70 (35 and 68). Three came in fried (oh well), and I ended up finding one that read 120 but the leakage was awful. Rest of them had very low leakage. I popped a few into my fuzz face (77 and 101 hfe) and they sound fantastic. Just built this, but I've modded it a bit (switched the places of the 2M2 and 2k49 so that it suits Russian germaniums without any lead twisting), and I'm really impressed how consistent the GT313s are. What sort of results did you get? With the Peak out of a batch of 20 they read between 39 and 66 hfe with zero leakage but I know the results aren't accurate because of the internal base/emitter resistor. I don't know how that will affect this method though. In a batch of 10, they were anywhere from 30 to 77, with most of them being around 45-60. This tester did show some leakage, but it was incredibly low, around .015mA, which may not be right. The tester did work fine, however. Are there any Russian germs that have higher hFEs? I'm looking for 100+, to save a bit of cash when I build a Buzzaround. Check out MP20A soviet germs.. Rated at 50-150 hFE. Also check P416A. These are rated at 60-120 hFE. Anyway. Here's the spreadsheet for the hFE calculations. Simple, quick and dirty. But saved me a lot of hazzle. My pleasure. Hope it's useful to others too. Went through my batch of 100 MP16Bs yesterday. Can't say they are as consistant as NPN MP38As, but still pretty good. Leaks from 50µA to 250µA, with one or two over that, while most, maybe 80% were close to 100µA. hFEs were all over the datasheet map - One over 100, maybe 10 in 90-100 range, another >10 in 80-90 range. Then the bags marked with 70-80 and 60-70 filled up pretty neatly. 60-70 bag filled also with that <10. Only a few were in range of 40-50. Still. A very good buy for the price. Can't wait to get the rest of my orders in. I think i'm love with soviet built components. That sounds like a really good spread of gains. I think I've only got 10 of these so I'll have to get in a bulk lot if you think they sound pretty good too. Got my hands full at the moment, but i have plans for these :) I'll let you know.. Went through my batch of 100 grey paint coated MP25Bs yesterday. According to datasheet, these should be 30-80 hFE, so i assumed i would get a whole lot in low, but still usable 51-60 and 61-70 devices in that 100. No. They are really consistant, but they are bad. Leaks are low, all between 80µA and 280µA with average around 120µA, but these are really low gain devices. 16% were under the rated 30, with measurements ranging from 23-29. I got both 30-40 and 40-50 ranges around 40% each and only 6 devices in the range of 51-60. I had to double check my power source and trimmer on the measuring board, but i have to believe it. I don't know what to do with those 16.. Decorative items maybe? or straight to trash. Under 30 hFE, i can't think any use for them. 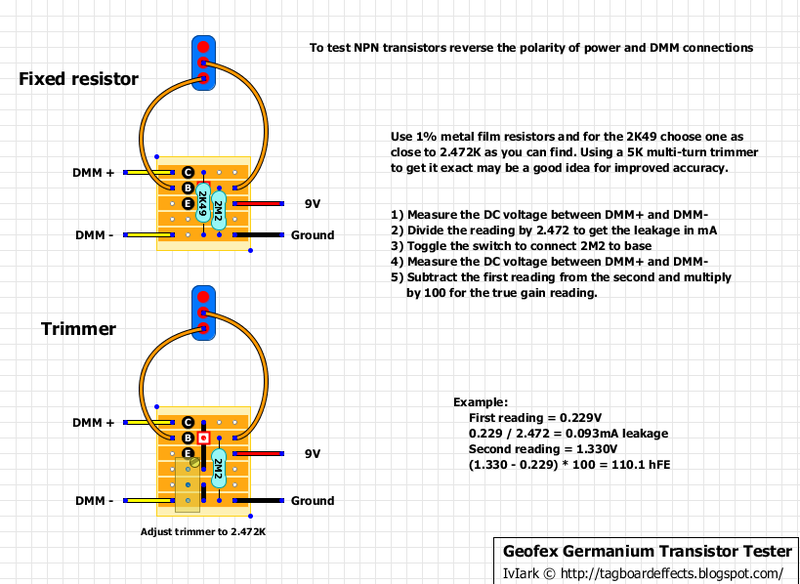 Still, i hoped for better batch, but now i do have lifetime supply of cool looking PNP germanium buffer transistors. These are currently going for $15 for hundred pcs on ebay. But i can't recommend them, unless you are looking for big, cheap batch of transistors to use as buffers. So you think tose 23-29 hFE ones could also work as buffers? Yes they'd be fine. The buffers are unity so you could use a transistor with virtually no gain. Can't recommend MP20 transistors to anyone. I had somewhat high hopes as the datasheet says 50-150 hFE... I thankfully bought only 60.
and supersad one with hFE of 94. Yes. RnFR has done a couple of circuits with lower gain Russian transistors in mind too so I'll have a look at it. I don't think that spread looks too bad though, the vast majority are in the 50-70 range and I've made some nice sounding classic fuzzes with that sort of gain range Russian trannie. You could use 2 of them at least in any MkII or Buzzaround, and you may even like the sound with a lower gain for Q3. I think i can find use for these too, but as datasheet suggested 50-150, i expected to get most in the range of 65-85. Well that shouldn't be happening. Are you sure you've got the pinouts right? Yup. Made one with the resistor and jumper from the trimmer switched do match the Russian germanium pinout. Then I made another with the standard pinout and twisted the pins to match it. Getting the same reasings. Now I'm 1.436 on with switch on and off. Sorry to be commenting so much. It eventually went up to 136mV and stayed there. So my official first Gt108 reading is 112.9 gain with .055 leakage. Not bad for Q2 fuzz face right? Sounds perfect. I've got a batch of GT108's too but haven't measured them yet, but that certainly sounds promising. This is exciting. All I think about is fuzz! All very useable. Q1 and Q2 in a Buzzaround or Tonebender are always recommended to be at the 50 to 60 end of the scale, so get a few more 100+ and you're laughing. And the GT108's are so tiny as well, so they'd be good for compact builds like a Fuzz Face in a 1590A. On reflection I'll probably have to get some more of them to stock up. Just received a package of NPN GT311Ks.. Thankfully i didn't get more than twenty. These have four legs, and one is for grounding the case. I started to handle these like any other NPN, but with breadboard, as their pinout is BCE. Couldn't get any leakage out of any of them, so i once again inspected my test rig from every angle. Found out from the internets that these seem to have internal shunt resistor, so there is virtually no leakage. Fine. That's good to hear. So i started to measure these with my meter's hFE tester with ground pin lifted. Even though the seller from russia stated on the item's details that they have hFE of 60...180(114*), with 114 stated as typical, i only got readings from 29 to 82. One 80 and one 82. Most of the rest were around 50-70. 50-70 NPN germs are nice, but they could have been better. I guess that these do need some breadboarding before soldering them to anything. Sadly most of the russian germs i've had tend to be always on the low end of the hFE range specified by the datasheet. All i've encountered are low on leakage, but that hardly compesates for low gains. I'm currently waiting for batches of PNP P416As and P416Bs. I do have pretty high hopes for those, as someone on the DIYSB stated that russian PNPs are usually better than NPNs. These probably need testing by ear to make sure the gain readings are correct. The reason being that the Peak identifies transistors with a shunt resistor between base and emitter, but it then gives a warning that the reading will not be accurate because of that. I don't know if this method has the same problem as the Peak but there's a good chance it has. Any luck with those P416B's ? I will probably buy a pack of 20 or 30 and just want to see if they are usable for the fuzzface clones. It looks like the GT308V , GT 309B and GT402B's have similar range of medium rangee hFe and are good candidates for a bit cleaner fuzzface and tone bender clones. I think i'm getting that DCA soon. Measuring AC176s is a pain. The measured voltages drop for a minute (unit of time, not a figure of speech) before settling, so measuring 120 pieces will take forever.. Flipping the switch seems to make the process faster, but not much. I think i'm going to leave these and wait until i get a DCA meter. I just made up a couple of jokes..
1. "I just bought a batch of western made germanium transistor that are super consistent with low leakage!" -said no-one ever. 2. "i just bought a batch of soviet made germanium transistors that are super high gain, but leaky!" -said no-one ever. In my current experience, all the russian ones are really low on leakage, but if the dataheet says 60-120, you're bound to get all of them between 55 and 95. With median in 65-75. Western ones are much higher in gain, but they are nowhere near consistent in leakage. And they are generally all over the datasheet. The best compromise I've come across are the 2N404's. Average gains higher than the majority of the Russian ones and although they all have some leakage, it's low. For something like a Tone Bender type circuit, a mix of Russian for Q1 and Q2 and the 2N404 for Q3 are a good blend. Or even see if you can get any GT402B's, they are the highest gain Russian germaniums I've bought. Again all have some leakage (out of 50 only 3 were high leakage, the rest were all usable) but the gain ranged from 61 to 170 for that 50 with 27 of them over 100. Only ones currently on evilbay are quite expensive. I'll keep an eye out. I must have been lucky with a lot of 50 GT308V that I got. All of them between 75-125, with about 20 of them over 100hfe. Should check the GT402B (b larin or B cirylic (V)? How would this work with those circular trims from tayda? I have a doubt with those extremely low leakage russian trannies and this tester. For example, I have one trannie with a first measure= 0,19 volts (0,076mA leakage) and a second measure of 0,47 volts ((0,47-0,19)x100= 45,1 hfe). Ok, as the leakage is nearly inexistent, the hfe could be checked with a ordinary multimeter. I've tested this trannie in two different meters, and the hfe reading is 73hfe in one, and 75 in the other one. So, something is not going OK. I've always been told that can't use a normal mm to measure germaniums as they take not into account the leakage, but... if the leakage is nearly 0, how can the hfe measurement be 30hfe less in this tester tahn in an ordinary mm? I've checked the germanium tester, and the trim is exactly set to 2,47k, using a power supply giving 9,65 volts. Has anyone checked a trannie similar to this (in leakage) with both a Peak and a normal multimeter? Are there differences? I mean (0,64-019)x100= 45hfe, was wrong in the previous comment. hey mark, what is "too much" of a current leak and how does it effect the circuit/sound? RG wrote in his "Technology of a Fuzz Face" article that anything over 300uA would be suspicious, anything over 500uA would be bad. I'm not sure it's as cut and dry as basing everything on the numbers, I've made a few great sounding pedals with leaky transistors, and some like the Tone Bender benefit from leakage in at least one of the positions. So RG's numbers may be a good guide but I'd still suggest socketing and trying them just so you can see how the leakage affects the sound to your ears. thanks, i got this mystery batch of ac128/176's, they were paired one and one but the matching parameters were unknown to the seller. they all have an excellent gain range (70-120) but if im measuring correctly the leakage is miserable. like 700ma and up. some even over 1.5! i tried a pair of 128's in my fuzz factory and the sound was probably 60% as good as the matched pair i bought specifically for it. ill have to throw the 176's in something low gainish to see how those sound. this tester should work with silicone trannys too right? put together an npn tonebender to test those ac176's and i found a pair that sound just great. most didnt sound too good but 2 out of 10 isnt bad right? Thanks for the link to the Peak atlas. It's downright AWESOME. I just ordered mine. Can't wait. Got my DCA55 today and remeasured all my germs. The tester circuit above is actually quite nice (nowhere near how nice the DCA55 is though:)). The mid-range hFEs were right on the money, but i had ~5% variation in the high and low end of the datasheet scale with DIY tester when compared to DCA55. I tested the MP20A which are prtty good, generally around 70-80, a few over 90, a few below 60. They all have a low leakage. OTOH, I can't test the GTs with this tester, I always have the same value around 9V, with or without the 2M2 resistor. I'm a long time lurker, first-time poster. I have a couple of questions about this tester. With regards the 2.49k resistor and trying to get it close to 2.472k for accuracy/easy maths, is there any reason to not chain a 2k, 470ohm and 2 ohm (or 2 x 1 ohm) resistors, to make this value, apart from neatness? Also, is there any reason to not use a PSU rather than a battery with this? Finally, is there any reason this wouldn't work for testing silicon transistors as well (obviously the leakage is negligible there), assuming polarity has been swapped for NPN etc? However you end up with your 2.472K and 9V is fine. Should work ok with silicon, but you have pretty accurate silicon testers on most cheap multimeters and so if you have a multimeter to measure the results of the tester, then most people will already be able to test silicons with no additional effort. Many thanks for your reply - thought I was barking up the right tree. Had completely forgotten my multimeter can test silicons! Seems to do the job more or less, but probably does not measure the leakage. Any comments please? I was looking at similar products before i bought my DCA55. It does cost you 5 times what that chinese unboxed thing costs, but as one of my co-worker once said "You'll forget about the money spent by tommorow, but if you have to use bad tools, you'll remember that for a long time." This comment isn't paid, but i'd still recommend getting proper tools. I'm glad I finally built this, I scored some PRIME goddamn NKT275's off ebay. Were relatively cheap too! Just measured them, the HFE's were: 78, 104, 120 and 181. Now there's two perfect sets for classic and high gain fuzz faces. All leakages below 120ua, one was pretty much zero. These will make awesome fuzzes. Next up some 2N2171's which are supposed to be pretty high gain nad low enough leakage for stable use. The seller listed them as 140-200 hfe. Hi everyone, Cansomebody tell me what the function to use for this test? thanks a lot for that who can help. Okay, so I built this, and set my multimeter to DCV. Something like 0.6XX shows up, then slowly over the next 10 min, the voltage slowly drops. Is this just my terrible multimeter being terrible? Or am I doing something wrong? That makes sense. The gain of these transistors goes up with the heat from your fingers and then drops as it cools, and so that's exactly what I would expect. Thanks. I gave up after getting through two transistors, and ordered a DCA55. Found a great price, ships from Japan. $60.90 USD, free shipping! on step 1 how long should it take once i turn power on to transistor for the meter to stop dropping and level out? Is this normal for the numbers to start high then drop way down and then stop?like when i tried to read them with my dmm on hfe setting? The gain and leakage of germanium transistors increases with even a small amount of heat, so the warmth from your fingers is enough to get the value higher and then start to drop when you're measuring. Best bet is to avoid touching the body altogether and just touch the leads, but if you do touch the body and transfer heat the most accurate reading is as it will be when boxed in a pedal, so you're going to have to leave it until the numbers stop changing, or at least until they slow to a trickle which should get you close enough. Remember that probably the most important thing about measuring isn't to get an absolutely bang on accurate number, because the best gain for any given pedal is completely subjective, but more to give you a point of comparison between the transistors you own, so you know which ones will give you lower and higher gain compared to the one you're auditioning. what setting do i use on my dmm mA or uA? What type of switch should be used, spdt? Basically, yes. Make sure the transistors orientation is correct when changing from type to type - that could be one reason you're getting weird readings. Make sure to give it time for the temperature to stabilise. I was wondering how to determine the leakage of transistors using this test circuit. The ones I have are AC128 with hfe ranging from 58 to 69. I'm trying to build a Tone Bender and need to know the leakages. The vero is not verified but it should be OK. I'm going to build this as soon as possible. Cheers from Russia and sorry for my English. Swap your power leads to make it NPN. Im having trouble testing npn’s with this. Ive recersed my power leads, and the multimeter connections, but get no change in reading when i insert the 2.2m resistor. 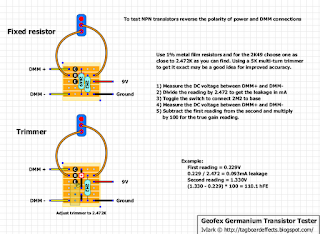 Ive tested dozens of germanium pnp’s on my breadboard with this circuit and had much success. And I get clear readings from my “mega328” transistor tester, which also confirms the leads for me, so i know my pinouts are correct. Any idea what my problem could be?